Die U2 Briefmarke erscheint im Rahmen einer 4er Serie mit dem Titel "Great Irish Songs". Neben U2 werden auch John McCormack (Danny Boy), Luke Kelly (On Raglan Road) und The Cranberries (Dreams) gewürdigt. 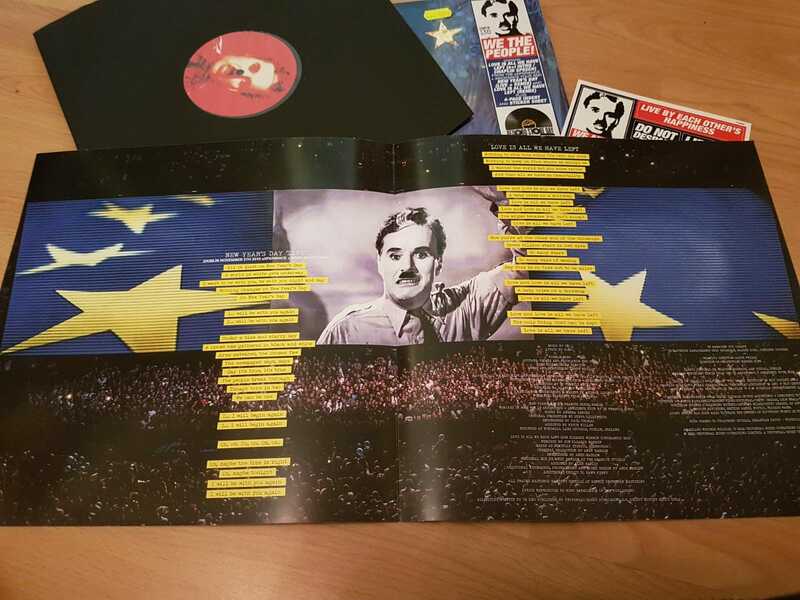 Die U2 Marke wird als einzelne Briefmarke (1,70 €), im Block mit 16 Briefmarken (27,20 €) und als spezielles Block-Set (17,00 €) im Design einer Vinyl erhältlich sein. Bei dem Block-Set müssen jedoch die Blocks aller vier Marken gekauft werden, da diese in einem sogenannten "Collectors Pack" zusammengefasst sind. Außerdem wird es noch einen Sonder-Ersttagsbrief (6,40 €) mit allen vier Marken und besonderem Dubliner Stempel geben. Die Briefmarken sind jeweils 3,6 cm * 3,6 cm groß. Das Design der Marken stammt übrigens von Amp Visual. U2 Fans kennen Amp Visual insbesondere durch das Buch Stealing Hearts at a Travelling Show (klick). Bestellen könnt ihr die Marken voraussichtlich ab Ende April direkt online bei der AN Post unter diesem (klick) Link. Aktuell werden die Marken dort jedoch noch nicht gelistet. Der Mindestbestellwert beträgt 2,00 €. Die Versandkosten sind relativ gering (um die 2,00 bis 3,00 €). Update: The issue date is postponed to 9 May. 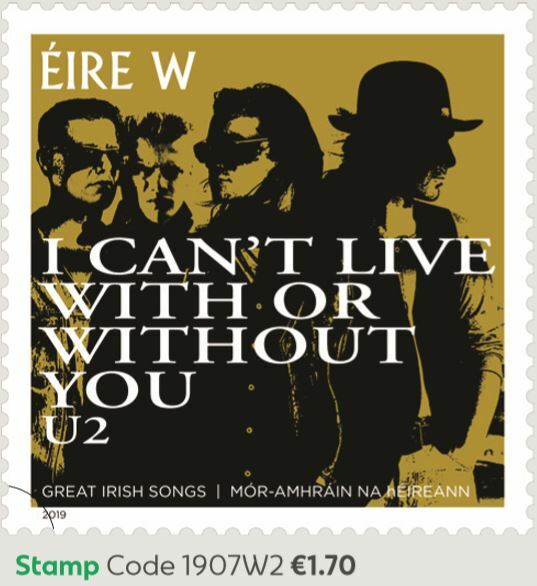 Ireland’s „AN Post“ will issue a U2 stamp on May, 2nd 9th. 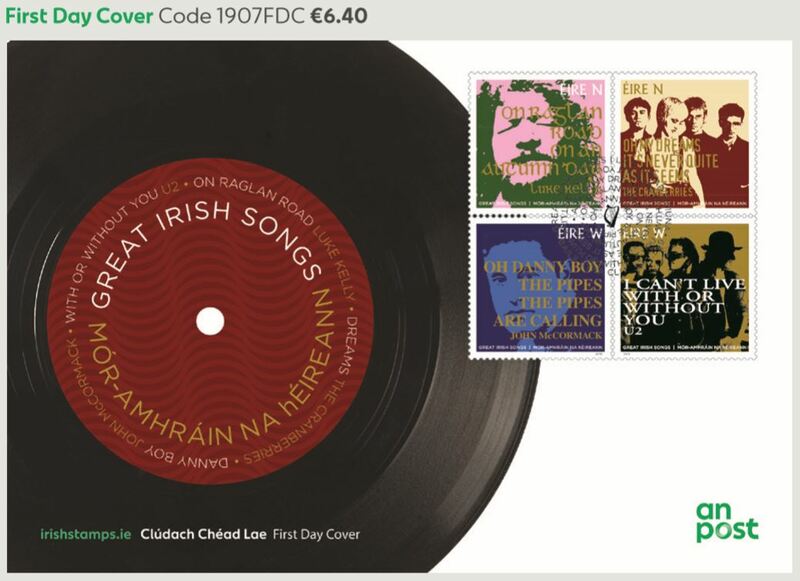 The stamp is part of a 4-stamp set called „Great Irish Songs“. 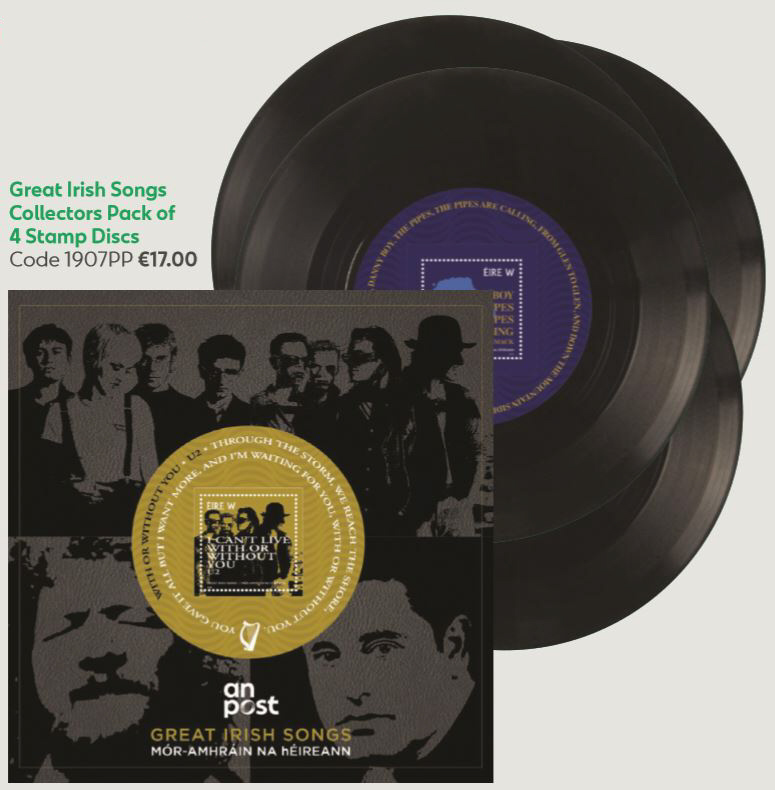 In addition to the U2 (With or Without You) stamp, stamps will also be issued for John McCormack (Danny Boy), Luke Kelly (On Raglan Road) and The Cranberries (Dreams). As usual the stamps will be marked with letters to indicate the value. The „N“ (=national) stamps are € 1.00 and the „W“ (=Worldwide) stamps (including the U2 stamp) will be € 1.70 The stamps will still be valid if the postage is increased by AN Post. So why not buying a few stamps for your next Ireland trip? 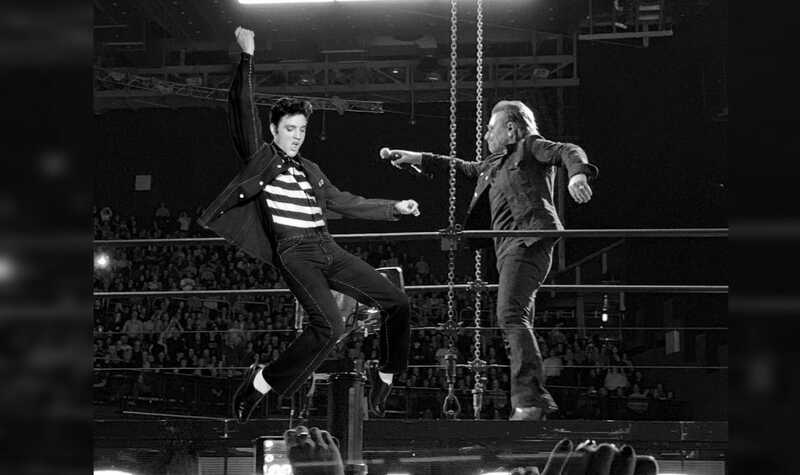 The U2 stamp will be issued as single stamp (€ 1.70), as sheetlet with 16 stamps (€ 27.20) and as special miniature sheet set (€ 17.00), in vinyl design. The U2 miniature sheet will be part of a „collectors pack“ with four miniature sheets (one of each stamp). Also there will be a special First Day Cover (€ 6.40) with all four stamps and a special Dublin postmark. Each stamp has the size of 3.6 cm * 3.6 cm. By the way: The stamps are designed by Amp Visual. Well known by U2 fans from the book Stealing Hearts at a Travelling Show. The stamps can be ordered online directly at the AN Post homepage here (click) from the end of April (therefore the stamps are not listed on the AN Post website right now).